Every musician dreams of the day their music rises to the top of the charts. But before that can happen, you need reliable instruments that blend together seamlessly and enhance the vocalist’s superb voices. One critical instrument that has helped bands rise to stardom is the bass guitar. But not all bass guitars are created equal. 2. Comfortable hand feeling, stylish outlook, stable performance and melodious sound. 3. Compared with ordinary guitar, it has thicker strings and larger string tension. To be honest, good is a subjective term – it means different things to different people. But I will still share with you 5 markings of a good guitar. Even though this is highly debated, luthiers swear by wood type. Different woods produce different tones, even in an electric bass guitar. After all, the sound being pumped through the amps and out the speakers is the acoustic sound of the guitar. So depending on what kind of sound you are looking for, research the woods. 4, 5, or 6 Strings, Which is better? This all comes down to experience. 4 strings are good enough if you are a beginner, and the range of notes you can play is also very wide. Needless to say, there are some styles of music (country and modern worship) that require 5-stringed basses. For the creative professional bassist, 5 and 6 strings give them more room to explore. As said earlier, when it comes to “good bass guitars”, the word good is subjective, and it is clearly evident when it comes to the “feel” of a guitar. Before purchasing a bass guitar, determine if it feels comfortable. A guitar that doesn’t feel good becomes a burden to play, not a pleasure. And that’s important. If your music doesn’t feel good to you, it won’t feel good to your listeners. This is determined by the distance between the frets, especially above the 12th. Do the notes play in tune as you go up the neck? If not, your bass guitar won’t be able to play in tune. Now that we have determined a few of the few factors that make a good guitar, let’s look at some of the best bass guitars on the market. There are a lot of great guitar brands to choose from as you hunt for your next bass guitar. Some are pioneers in the electric guitar business (like Fender) and others are relatively new. So which bass guitar should you choose? As a beginner, you don’t need a fancy, expensive 6-string bass guitar. Your best option would be a good budget guitar. Here are a few for you to consider. Ibanez Bass Guitar (GSR200). This is a beautifully designed, budget priced and great sounding guitar for beginners. You won’t go wrong with. This is one of the best guitar brands today. Squire By Fender. 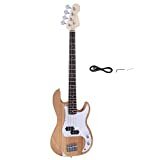 Another excellent choice for those on the hunt for a simple yet effective bass guitar (you can’t go wrong with a fender). Yamaha TRBX174EW. This natural wood 4-string bass guitar strikes the perfect balance between price and practicality. Tone is definitely not compromised with this one. After playing your beginner bass guitar for a while, it tends to lose its novelty and spark. It becomes less exciting. Actually, it’s not the guitar that has changed, it’s you. You need a new guitar. Time to put the beginner strings down and get something a bit more advanced (and exciting). Ibanez SR500. This Ibanez bass guitar is crafted from mahogany wood and produces a warm, resonant sound that rumbles beautifully in the lows. Schecter Stiletto Custom 4. One of the best features of this bass guitar is the versatile EQ, allowing it to perform very well in many styles. Epiphone Thunderbird PRO. If you are into hard rock and metal, you will fall in love with this piece. It produces the perfect bass for the genre. Spector NS-5XL USA 5-String Bass. This heavy-hitting beauty is a familiar sight on stages and in studios all over the world. And for good reasons to. Easy playability, awesome pickups (EMG 40DCS), and gold plated bridge and tuners are just some of the few things that make it an amazing instrument. Ibanez Gerald Veasley Signature. Not only is this a gorgeous looking 6-String electric bass guitar, but as its name says, it’s the best bass guitar for making signature sounds. Lakland Skyline Hollowbody Bass. With Lakland’s reputation for attention to detail, this stunningly crafted bass guitar certainly performs as good as it looks. Now that you are equipped to be the best bassist of our generation, put those fingers to work strumming some sweet melodies on your bass guitar. Practice makes perfect as they say, and soon you will be making the likes of Leland Sklar running for their money.